Dogecoin, a so called altcoin, fights against the downslide of the general cryptocurrency market. 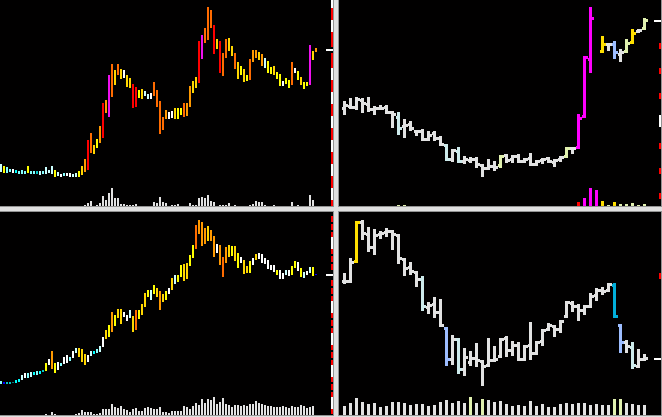 Upper charts are Dogecoin and lower are Bitcoin for comparison. The daily chart at the right shows an upshot of about factor three in about two weeks. The relative strength seems to be caused by Yahoo Finance. They announced that Dogecoin and three other coins can now be traded directly on their iOS app. The other three are Bitcoin, Ethereum, and Litecoin, which are all more established or seen as “serious” cryptocurrencies.